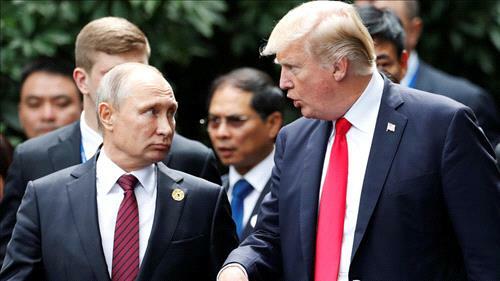 AMMONNEWS - US President Donald Trump said he had low expectations for the Monday summit with Kremlin chief Vladimir Putin just days after 12 Russian intelligence officers were charged by a federal grand jury for hacking the Democrats ahead of the 2016 election. Trump has repeatedly said the investigation into suspected Russian interference in the 2016 US election - which he casts as a “rigged witch hunt” - makes it hard for him to do substantive deals with Moscow. “We have asked, and the Russians have agreed, that it will be basically unstructured. We are not looking for concrete deliverables,” White House national security adviser, John Bolton, told ABC’s “This Week” in an interview. “It isn’t a summit,” US Ambassador to Russia Jon Huntsman told NBC’S “Meet the Press” moderator Chuck Todd. When asked by CBS if he would ask Putin to extradite the Russians to the United States, Trump said he hadn’t thought of that idea but that he might. Russia’s constitution forbids the extradition of its own citizens. When Trump meets Putin, he sits down with a disciplined, detail-oriented and experienced Russian leader who has played on the world stage for more than 18 years, in contrast to the US president’s 18 months in office. Around 2,500 people gathered in Helsinki for a peaceful demonstration to promote human rights, the protection of the environment and democracy ahead of the summit on Sunday. Trump has said he wants to raise nuclear arms control, Ukraine and Syria with Putin, who has served as Russia’s preeminent leader since Boris Yeltsin resigned on the last day of 1999. German Foreign Minister Heiko Maas warned Trump against making any unilateral deals with Russia that come with a cost for the United States’ Western allies. Trump was seen playing golf on Sunday at his course by two Reuters reporters. Putin was expected to attend the soccer World Cup final between France and Croatia at the Luzhniki stadium in Moscow on Sunday.